NPR’s Michel Martin speaks with tap dancer Chloe Arnold, of the Syncopated Ladies, about their viral dance videos and annual tap festival. Following the re-election of Prime Minister Benjamin Netanyahu, NPR’s Michel Martin speaks with Nadine Epstein, editor-in-chief of Moment Magazine, about the American Jewish community’s impact on Israeli politics. NPR’s Michel Martin speaks with Abderrahim Foukara, Al Jazeera’s Washington, D.C. bureau chief, about the recent regime changes in Algeria and Sudan. Yo-Yo Ma brought his Bach Project to the sister cities of Laredo, Texas, and Nuevo Laredo, Mexico. The project uses the music of Johann Sebastian Bach to explore connections between cultures. 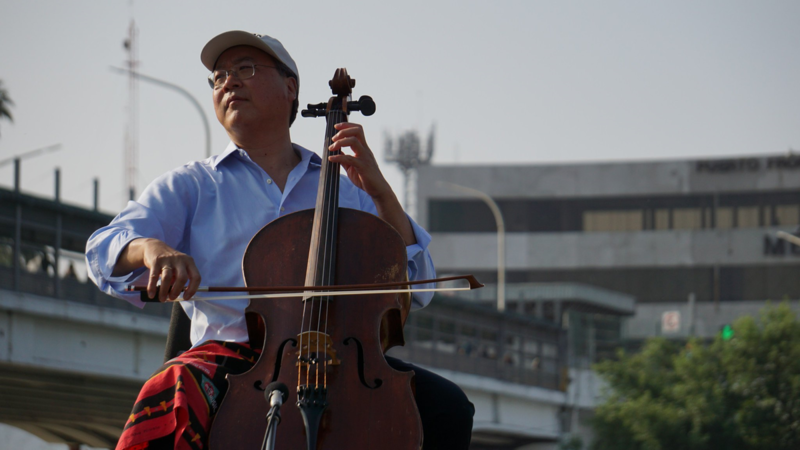 World-renowned cellist Yo-Yo Ma brought his Bach Project to the sister cities of Laredo, Texas, and Nuevo Laredo, Mexico, on Saturday. Laredo’s “Day of Action” featured performances in both cities to celebrate the relationship between the two communities. Ma played the opening notes of Johann Sebastian Bach’s “Suite No. 1 for Unaccompanied Cello” in a park next to the Juarez-Lincoln International Bridge, one of the crossings that connect the U.S. and Mexican cities. The Laredo performance took place on an elevated stage before an audience of officials and onlookers. Concerns over possible rain disappeared as Ma began to play in the morning sunshine. It was part of his Bach Project, which uses the composer’s 300-year-old music to explore connections between cultures. The project has taken him all over the world. On Friday it brought him to Laurie Auditorium at Trinity University in San Antonio, and on Saturday it brought him to Laredo, within a few feet of the Rio Grande. Mateo Bailey, 16, lives in San Antonio. He grew up in El Paso, plays the cello, and is the son of Grammy Award-winning cellist Zuill Bailey. Pete Saenz, mayor of Laredo, said despite the river and despite the bridge spanning overhead, the border is one community. This “Day of Action” also included a performance in Plaza Juarez in Nuevo Laredo, a few blocks from the international crossing. Its overall theme was an appreciation for the connections between the two cities, which see themselves as one community. Ma was originally scheduled to play on the actual bridge, which would be briefly closed. The planned closure would’ve been a collaborative effort between officials and residents on both sides of the border. But the traffic and pedestrian delays the performance would have caused convinced officials to move the locale to the Tres Laredos Park right next to the bridge. The famous cellist has studied and performed the German composer’s music for six decades. In 2018, Ma set out on a two-year journey to perform Bach’s six suites for cello in 36 locations around the world. He felt the music had an ability to connect cultures and humanity from all walks of life. He said that is what motivated him to launch the project. Donald Glover performing as Childish Gambino in 2018. Guava Island, a new film featuring Glover and Rihanna, premiered at Coachella, where Childish Gambino headlined on Friday. Guava Island, Childish Gambino’s long-awaited new project, has finally arrived. 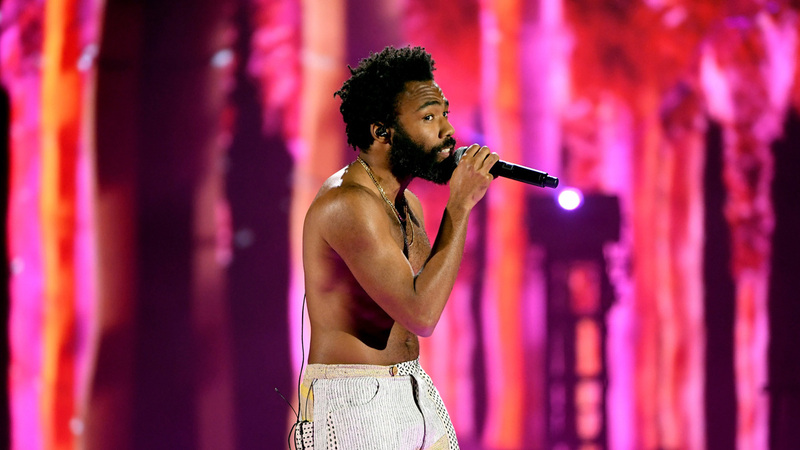 Hot off a headlining Coachella performance Friday night, Guava Island is the proverbial cherry on top of Donald Glover’s wildly successful year as a rapper, following his first Billboard No. 1 with “This Is America” in 2018 and that song’s wins for Song of the Year and Record of the Year at the Grammy awards earlier this year — the first rap song to ever win both those prizes. Anticipation for Guava Island was first stoked months in advance with a single photo of Glover and Rihanna on set in Cuba, spurring grandiose speculation as to what the project would entail — especially since it’s tied to Glover’s retirement of the Childish Gambino project. Longtime collaborator Hiro Murai directed (Murai is also the director of the “This Is America” video and many episodes of Glover’s TV series Atlanta) and the screenplay was written by Stephen Glover, Donald’s brother and a writer on Atlanta. Almost as if to curtail the expectations, the film itself is a modestly stunning — and at times unnerving — extended music video, shot in 4:3 aspect ratio, about music’s power to unite in the face of tyranny and greed. It features three new songs, “Die With You,” “Time” and the flamenco-tinged “Saturday,” as well as renditions of the previously released “Summertime Magic,” “Feels Like Summer” and notably, a sequence showcasing “This Is America” that recalls Murai’s music video from last year. A quick summary of the plot: Glover stars as Deni Maroon, a Purple Rain-esque folk hero and local celebrity on the island — exploited for its natural splendor and transformed into a factory spinning silk run by a single despot, played by Nonso Anonzie. Rihanna plays his partner, Kofi Novia. The pair meets in a gorgeous animated backstory at the start of the film. Deni’s set on uniting the island with a music festival, but it comes at a cost. Black Panther’s Letitia Wright also plays a role. Guava Island is streaming on Amazon for free today until 9 p.m. EST. After that time, it’ll be available only to Amazon Prime members. It will also stream once on YouTube’s Coachella live stream, starting at 8 p.m ET / 5 p.m. PT. Our panelists predict what we’ll find when we zoom in on that photo of the black hole. Bill Kurtis reads three news-related limericks: The Truth about Cats and Dogs, Furniture Cast and Lavatory Loudness. All the news we couldn’t fit anywhere else. 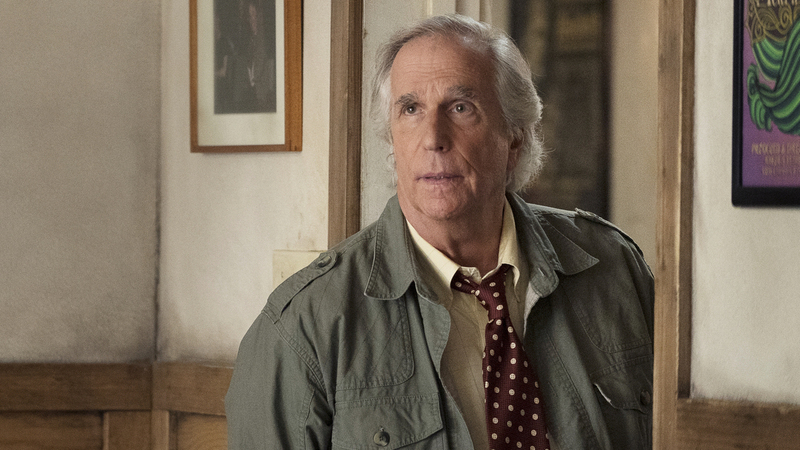 Henry Winkler won an Emmy Award for playing acting teacher Gene Cousineau on the HBO series Barry. 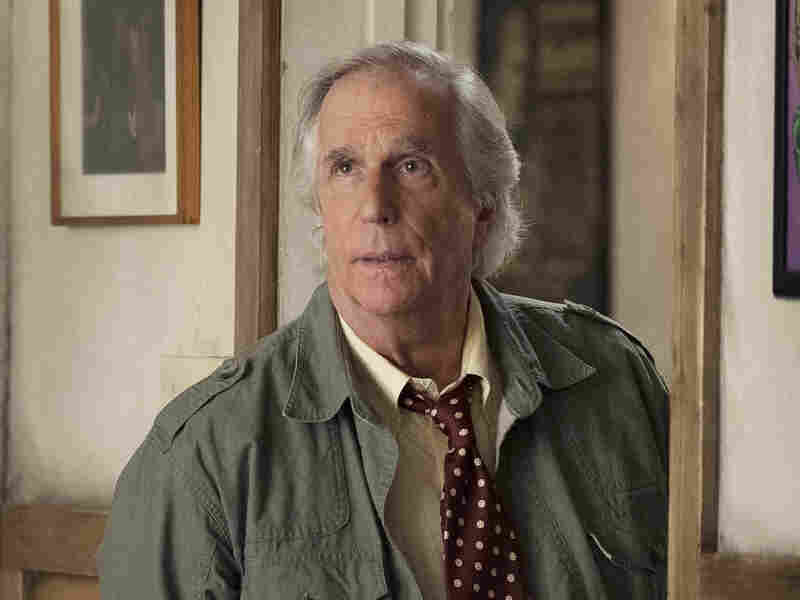 ‘I Never Had A Plan B’: Henry Winkler On His Career, From The Fonz To ‘Barry’: The actor talks with Fresh Air‘s Terry Gross about struggling with typecasting after Happy Days, his family’s immigration story and about how he found out in his 30s that he had dyslexia. Wily And Clever, Billie Eilish’s Debut Album Sounds Like No One Else: The 17-year-old California singer-songwriter’s album, When We Fall Asleep, Where Do We Go? keeps listeners guessing. Her frame of reference is vast — ranging from glam rock to folk music. 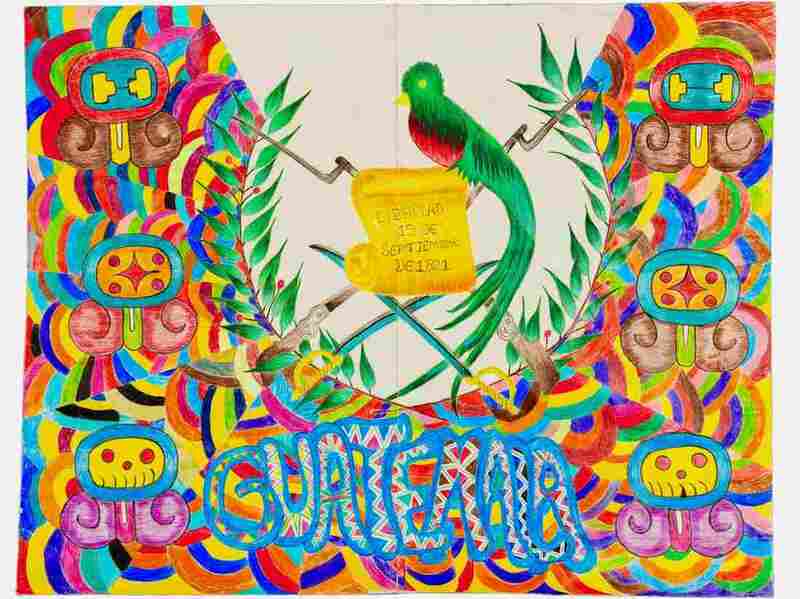 An acrylic piece created by a group of teens featuring the Quetzal, the national bird of Guatemala. An art show opens in El Paso today. It’s what they call a “multi-sensory exhibit” that includes works like a chapel, cut from cardboard, surrounded by trees and hedges spun from yarn, with Popsicle stick church pews and crosses. There are many images of bright birds, cooing in trees; and a looming volcano, smoking over a bright, cheery town. The art was created by teenagers from Honduras, Guatemala, El Salvador, and other countries when they were held in the Tornillo Children’s Detention center in El Paso County between June 2018 and January 2019. More than 6,000 youngsters, called “unaccompanied alien” children, or UACs, in the argot of bureaucracy, passed through there. The teenagers lived in tents for weeks, which often turned into months, with no idea when they might get out. A group of local teachers assigned to the shelter invited youngsters to create works of art: drawings, paintings, knitting, embroidery, and clay figures. Many drew smiling parrots. Many sketched or painted scenes from a town church, with kindly countenances of the Madonna. Some cut and sewed traditional dresses. 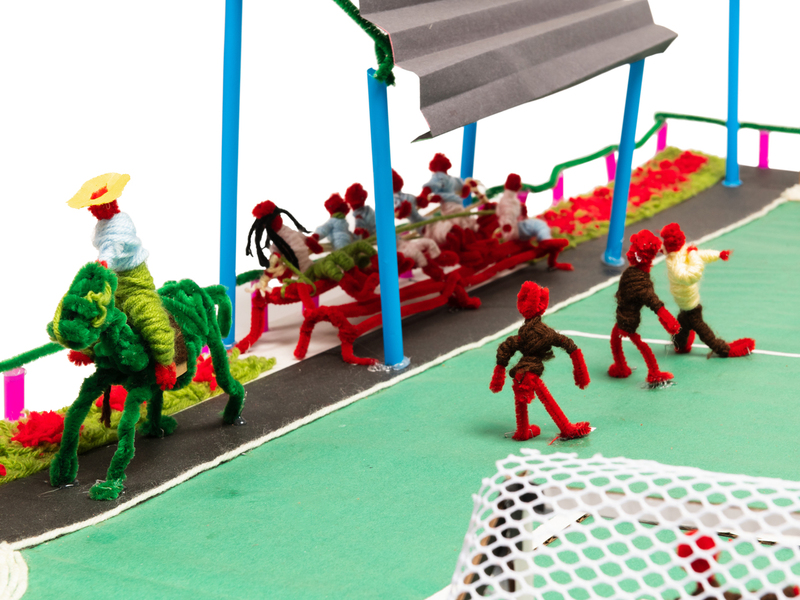 Many made clay figures of children, who played soccer, or rode and walked along with mules, alongside roads dotted with knit green hedges and trees. One painting shows birds flocking over a forest that is thick with fuchsia trees, against a sky of orange and red. When Tornillo began to be dismantled in January, workers started to get rid of the artwork. But Father Rafael Garcia from El Paso’s Sacred Heart Parish, who had said mass at the camp, didn’t want the art of the children to be thrown away and forgotten. The art they made will be displayed at the Centennial Museum at the University of Texas at El Paso, and at the Museo Urbano in the Duranguito neighborhood until October. A close-up of a piece depicting a soccer match made using construction paper, yarn and pipe cleaners.